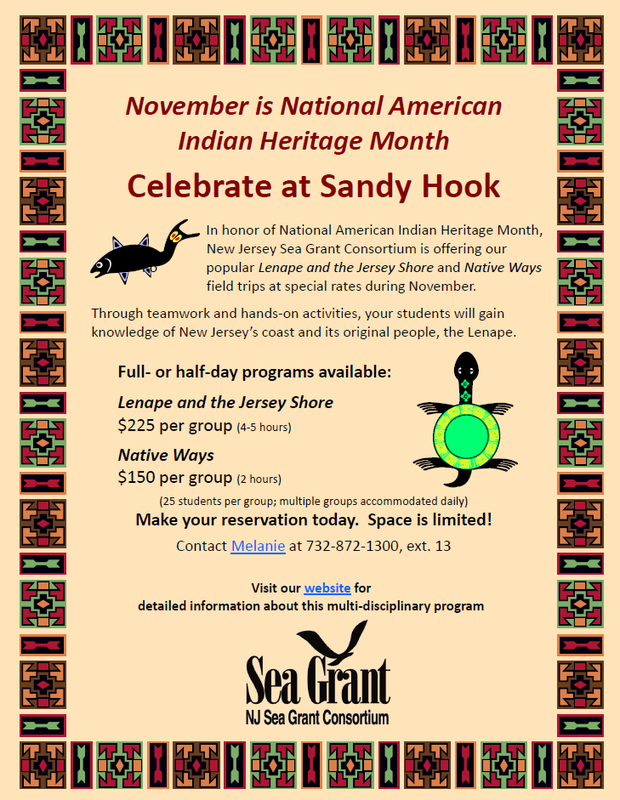 Celebrate National American Indian Heritage Month with NJSGC this November! Throughout November, the New Jersey Sea Grant Consortium offers both full and half-day outdoor programs focused on the historic coastal lifestyle of New Jersey’s natives, the Lenape people. “Lenape and the Jersey Shore” and “Native Ways” are both suitable for students in Grades 2nd -6th. These “hands-on” programs involve students in problem solving and teamwork through an exploration of Sandy Hook’s marine environment from the perspective of the native people who once lived there. By focusing on coastal community life, students will gain insight into the Lenape lifestyle, organization, and traditions. Please contact NJSGC’s Education Associate Melanie Tarling at 732-872-1300 x13 for more information!